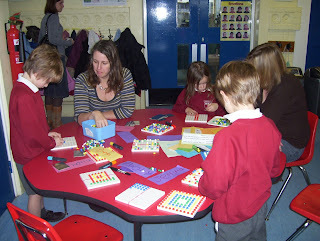 Here are a selection of photos from our recent Share sessions with Classes JC and LC on 26th & 27th January. Our theme was number fun. 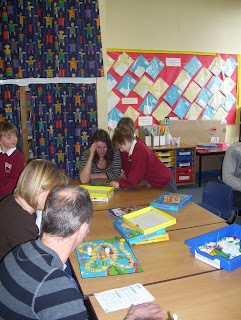 There was a variety of games and activities which the children and parents could take part in. 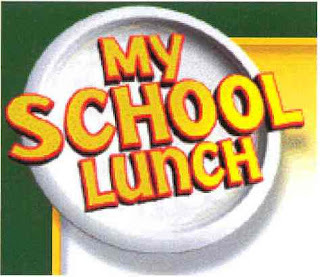 It was great to see such a large number of adults coming in to school to share this tme with their children. Thank you to Mrs Harold and Mrs Wadell for organising this event. Mr Byer has ben running a very popular lunchtime chess club. Last week they started playing an inter house tournament. This week they also had a match against another school (Clifford Road Primary) which Robert Hitchams won by 15 points to 4. Welldone to everybody andthanks to Mr Byer for organising these events. 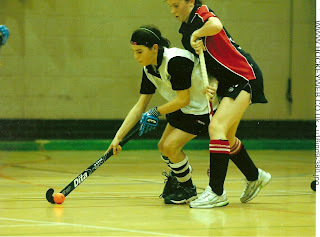 Two former pupils of Sir Robert Hitcham's have become National Under 16 Hockey Champions this week. 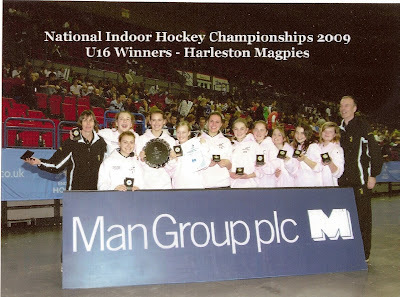 Amy and Sarah Brook (who only left SRH 18 months ago) were part of the Harleston Magpies U16 team who triumphed in the National Indor Arena, Birmingham last Sunday. The competition involved the champions from all regions of England. Magpies were there as East Champions. They had to play matches on Friday and Saturday. The Final match (on Sunday) was filmed by Sky TV and played infront of thousands of people in a huge arena. For a full report on their incredible achievement follow this ink. Look out for a report and the East Anglian Daily Times this Saturday. Below you can watch a video of the presentation ceremony. 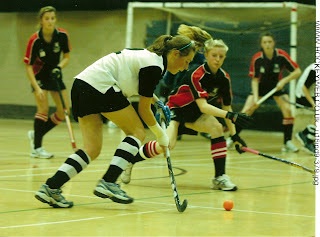 There are 5 current and 6 former pupils of SRH playing hockey at Magpies. If anybody else (boys or girls from Year 3 upwards) is interested in getting involved then please speak to Mr Brook. Beginners courses will be starting after Easter. The club runs coaching and teams for boys and girls for Under 9s, U111, U13 and so on. 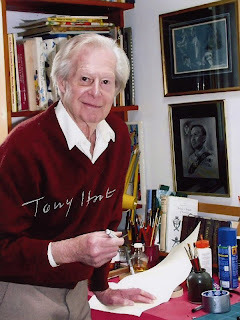 Tony Hart died last weekend aged 83. He has been an inspiration to teachers and children for over 50 years on television. We have used his 'Vision on' music to accompany our online picture galleries (of children's art work). Did you know that Tony designed the Blue Peter logo many years ago. His involvement in children's tv goes back 50 years. He has started off more recent art program ideas such as 'Art Attack'. One of my favourite creations (of Tony's) was 'Morph'. Morph has lead to 'Creature Comforts' and then to Wallace and Gromit. I have been making 'Stop- go animations with children for years. Below you can see a short film made by members of our lunchtime computer club. It involved 108 photographs and the movie maker program. By making even a short film like this it takes a few hours work. 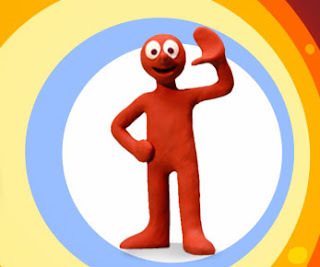 Imagine how long it must have taken Tony Hart to make his Morph films. Wallace and Gromit films take about 3 years to make. Watch below one of our recent picture galleries using Tony's 'Vision on' music. Last week we had our annual visit from Cornelius & Jones. His latest production demonstrated some brilliant puppet work. The photographs were taken by two boys in year 6 (Harry & Luke) and the videos by Molly & Georgina. Watch these videos for highlights of the show. You can see some incredible skills with puppets. Book your tickets by Wednesday 28th Jan. Please can we advise parents that Mrs Bone is likely to be off for a number of weeks. SCC are unable to provide a supply Patrol Officer and I am afraid the school is be unable to cover too, except when PC Hassler is available to do this for us. Parents should take care when crossing their children over College Road, and we would suggest that no child is left to cross this road unaccompanied until further notice. Thank you for your assistance in this matter. We will be trialling keeping the door by the Office locked at ALL TIMES for added security. Any parent wishing to come to the office in the morning can be seen at the reception window or ‘buzzed’ through with their children by the office staff if necessary. Other children and parents should use the other doors to enter the school. The only unaccompanied children to come through this door should be the bus children but only if the bus is late. Due to staff training THIS THURSDAY there will be no recorder club for those taught by Miss Ashberry and Mrs Hopkins. We would like to remind parents that DCSF advice states that routine appointments for dental/medical reasons should be made for after school or during the holidays. We do appreciate this is not always possible, but if an appointment does have to be made during school time could parents please let the class teacher know as much in advance as possible in writing. Thank you. The booklet ‘Attendance – a Guide For Parents’ is available from the school office for any parent who would like one. Parents new to the school will be receiving one in the ‘starter pack’ shortly. 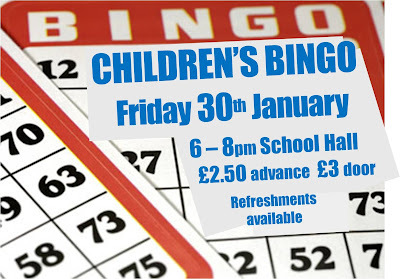 The Friends are running a Bingo Evening on Friday 30 January, they have asked that we advise you that with previous events selling out, you may wish to purchase tickets sooner rather than later. Letters with ticket application slips will be sent home this week. Prickles (our school mascot) went to Cornwall for Christmas with the Brooks family. You can see what he got up to in the film below. These reports are confidential and are addressed to yourselves as parents and we would ask that you advise your children not to open the reports before they get home. A separate letter is enclosed giving details about the activities that go on during the spring term, please note that Maypole does not start until after half term. Mrs Pascoe will be sending a letter home nearer the time. As many of you may have noticed we now have security door locks on the 3 main entrances to the school – by the office, by the hall, into the downstairs corridor to Reception / KS2. These doors will go into automatic ‘LOCK-DOWN’ at 9am opening only for break / lunch time and end of school. If you are in school at any other time, you will need to press the ‘green button’ to exit. To come into school when the doors are locked you must press the buzzer beside the door to the hall or office, so that office staff can let you in. The Times newspaper is running a campaign in 2009 offering free books to schools. Each day they will print tokens which parents can collect and bring to school. We will collate all the tokens and order free books for the library and classrooms. We are pleased to announce that the school has been awarded an Activemark Award; these are given to schools to reward delivery of the national PE, School Sport and Club links strategy. It recognises that 90% or more of pupils are achieving at least 2 hours high quality PE and sport a week. Many parents now receive their whole school letters by email. If you would like to register please do email us saying so (admin@hitchams.suffolk.sch.uk). We are endeavouring not to produce a ‘hard’ copy to those households that receive letters by email, so please ensure your child is aware they do not need to receive a paper copy. Those who are already registered do not need to re-register. Our Key Stage 2 Carol Service raised £177.85. Thank you for your generous support. Unfortunately Mrs Bone, our crossing patrol officer has broken her wrist. Although we do have some cover we need an additional ‘supply’ crossing patrol. If any parent would be interested in being trained for this role please contact the school office on 723354 (Rate of Pay on application). Guidelines from County and the Health Service state that “Pupils or staff ill with diarrhoea and vomiting should remain absent from school until 48 hours following their last symptom”. If there is an outbreak of this virus in school, please can parents stick to these guidelines to help ensure it does not spread. Thank you. A performance of The Nutcracker is to take place during the morning of Tuesday 13 January for the whole school including Nursery. The cost of this performance is £335 therefore we would ask for a voluntary donation of £1 per child. According to the Governors’ Policy of Charges and Remissions for School Activities parents who are in receipt of: (a) Income Support; (b) Income Based Job Seekers Allowance; (c) Child Tax Credit and do not receive Working Tax Credit and who have an annual taxable income of less than £15,575; (d) Support under Part VI of the Immigration and Asylum Act 1999; or (e) a guaranteed element of State Pension Credit do not need to pay for this event. Nor will they be expected to make a voluntary contribution of money unless they wish to do so. Teachers will deal with the collection of money in the same sensitive way that operates for those children who receive free school meals. Please complete the reply slip and return to the school office by Monday 12 January.